Owning and managing a successful pub, winery, or brewery business is especially hard and time consuming. You have to find time to manage everything otherwise you will lose your customers. Having a website for your business also requires time, especially if you not using the proper theme. To save you the struggle, we have listed the best WordPress templates for pubs, wineries, and brewery. If you already know what you want and need selecting a good theme for your business should not be hard. The WordPress themes featured on this list are specifically designed for this niche and industry and they will easily mold to your requirements. To keep this short and to the point, here are the best WordPress templates for pubs, wineries, and brewery. WordPress templates for pubs, wineries, and brewery such as Craft Beer are the best bet you have. It is crucial for your business to use one of these themes because they contain features and tools that will aid you each step of the way. 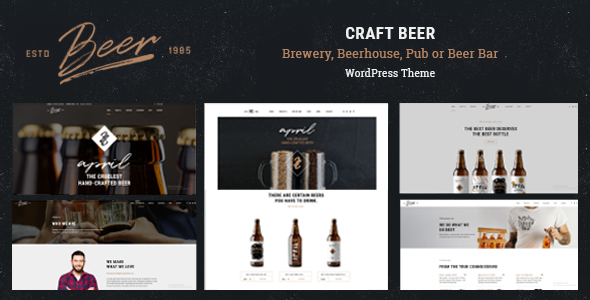 Craft Beer offers a full responsive design, six gorgeous homepages, WooCommerce integration, custom brewery icons, demo content, page builder, portfolio section, header layouts, translation support, and more. This theme is the ideal choice if are planning on marketing your pub or brewery a bit more. Check out Craft Beer! 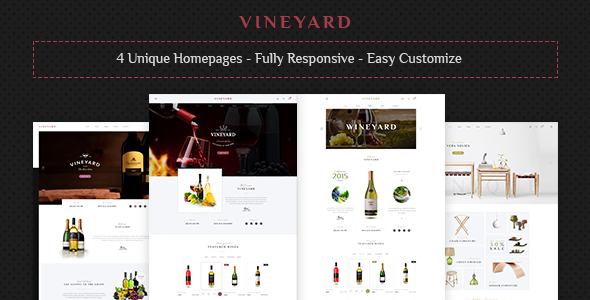 WordPress templates for pubs, wineries, and brewery can be hard to come by, which is why Vineyard was developed. 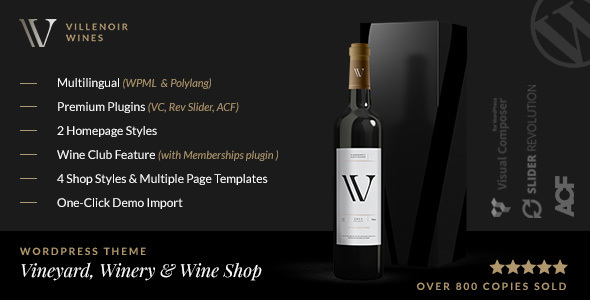 This theme combines an original and chic design with features perfected for wineries. Getting started with Vineyard is a piece of cake because it comes with the demo content and 4 already built homepages. Each element and tool on this theme is completely responsive and cross-browser compatible. If you want to get down and dirty you can customize the pre-designed demos or develop your own. Experiment with Vineyard and see what works for your business. Try it today! Villenoir is a theme that will give you the best chance of promoting your services and products while featuring a winery related design and maintaining a friendly approach. Truth be told, if you own a wine related business or pub this is the theme to get. If you combine Slider Revolution and Visual Composer you can create any layout you have in mind. Another option is to use their custom page templates designed specifically to enhance beverage related content. 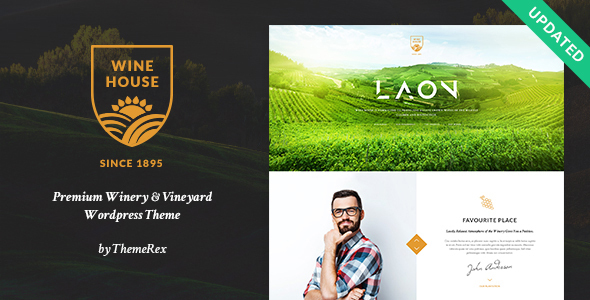 You need to try this refreshing and original WordPress template for pubs wineries and brewery. Laon is a stunning, colorful, clean, and unique theme that still keeps a professional design while being playful. This theme comes looking beautiful from the start, but can also be easily adapted to match your personality. Laon has a powerful theme admin panel you can use to set it up and customize it. Laon also gives you access to homepage demos, a responsive layout, page builder, Google fonts, Fontello icons, adaptable color scheme, back to top, landing page layout, video slider, and multiple shortcodes. These options will help you customize the theme without touching a single line of code. Achieve greatness with Laon! The best thing about this theme is that it can adapt to any industry or niche and improve it. Oshine has a long and bright future ahead of it because of this flexibility and professionalism. When you first notice this incredible theme you cannot help but be taken aback by its stunning and modern design. It comes with no less than 39 pre-designed demos you can choose from. Its latest release integrated Colorhub which will help you change the colors of your website easily and effortlessly. Page layouts are crafted using Oshine’s integrated page builder, Tatsu. Oshine is a webmaster’s hero! 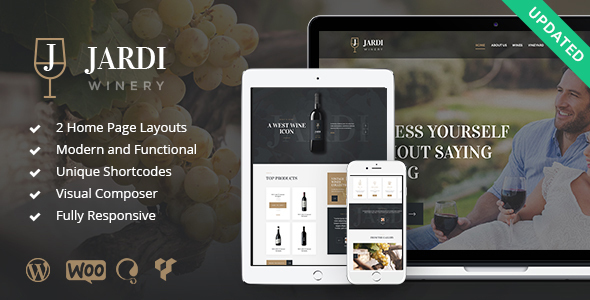 Jardi is a classy, pristine, impeccable, astonishing, and responsive WordPress template for pubs, wineries, and brewery. Jardi is completely responsive, retina ready, mobile optimized, and cross-browser adaptable. In addition to this, Jardi includes 4 home page layouts, Visual Composer and shortcodes, translation files, shortcode builder, free support, shop page, media content manager, 2 powerful slider plugins, navigation options, and several layout features. Moreover, this theme comes with a full documentation and 100% free support. Jardi is one of the WordPress templates for pubs, wineries, and brewery that deserve your attention. 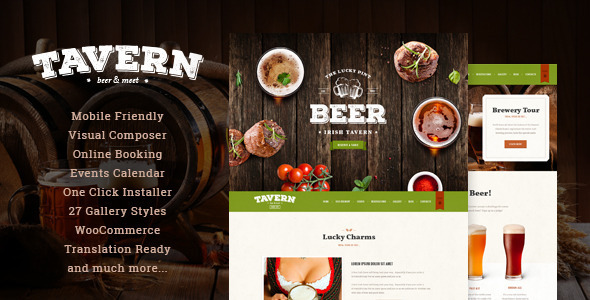 Tavern is known for being a gorgeous and responsive WordPress template for pubs, wineries, and brewery. Since its last update it even took it up a notch by increasing its features number and design improvement. Every user that will visit your website will have a one of a kind experience if you choose Tavern for your business. Tavern comes integrated with table reservation system, shortcode builder and Visual Composer, gallery templates, Tribe Events plugin, WP Booking Calendar, Slider Revolution, Essential Grid WP plugin, and professional support. Get Tavern today and build a professional looking website without much effort. Out of all these WordPress templates for pubs, wineries, and brewery Jz Pub & Bar is my favorite one by far. This theme is responsive, impressive, and clean and will help anyone showcase their products and services. 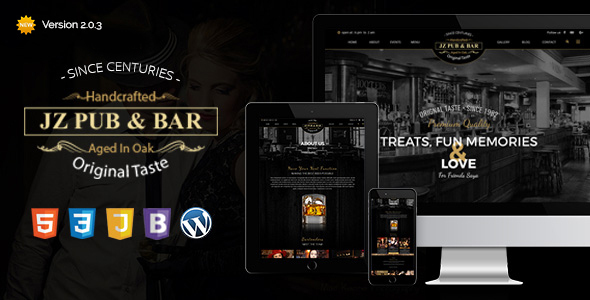 Jz Pub & Bar requires no coding skills necessary to manage it and it comes with 5 sliders, header styles, footer styles, one click demo content installation, social media integration, event manager, more than 500 Google fonts, and different layouts. This theme is compatible with WPML so you can easily turn your website into a multilingual one. Got the subtle hint from its name? Infinite was developed to help you create infinite page layouts thanks to its flexibility and functionality. Each layout you create using Infinite will look effortless and flawless to your audience which is what you should look for in a WordPress templates for pubs, wineries, and brewery. 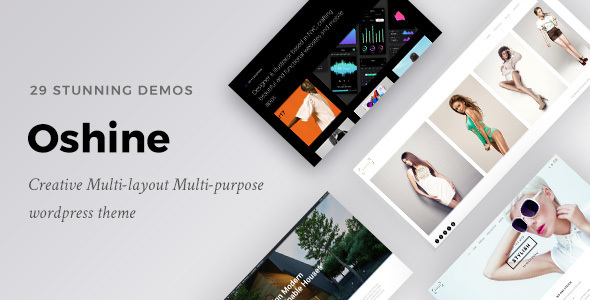 Infinite includes the GoodLayers plugin, a handful of demos, responsive design, demo importer, advanced admin panel, Master Slider, RTL support, live customizer, auto updater, unlimited sidebars, and integrated Google fonts. Long story short, your pub needs this theme! Owning a successful winery, pub, or brewery requires crafting, marketing, and people skills. Porter Pub can help you with the last one by engaging your visitors and charming them. Porter Pub offers menu options, WooCommerce and store integration, events’ managing plugin, portfolio styles, blog layouts, section options, shortcodes, animations, color management, fonts, mega menu, and form builder. 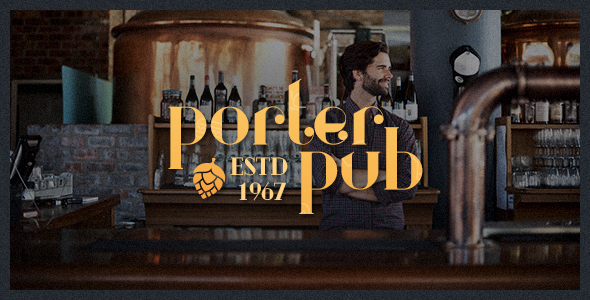 Porter Pub puts all these options at your fingertips through its advanced theme panel. Choose this theme for your business to appeal your audience. Kallyas is a feature-packed, beautiful, highly-customizable, and business looking WordPress theme for pubs, wineries, and brewery. Its design is stylish, modern, and uncluttered making a good first impression on your potential clients. Kallyas offers you full control over your layout and design and if you need some inspiration you can check out its website demos. However, you can also create your own layout and put your creativity to work. No matter what design you have in mind, with Kallyas it is possible. Does not matter what type of business you run, you will need a theme that will mold to your needs and vision and STEAM is the perfect choice. This theme will prompt enough interest in your audience that will make them want to learn more and eventually turn them into clients. You can notice from the first look that STEAM focuses on design and professionalism. The front page is built with engaging elements perfected to draw and maintain the attention of visitors. Using its live customizer you can alter and customize it to fit your business. 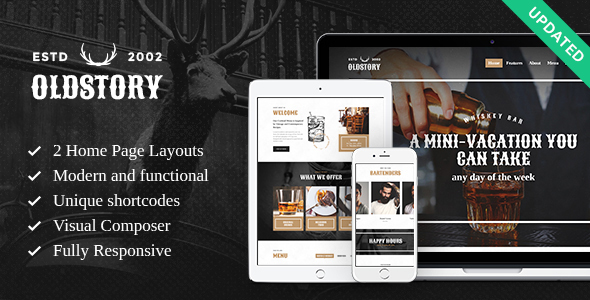 While there are no too many perfected WordPress template for pubs, wineries, and brewery, OldStory is one. With this incredible theme you will get a unique and beautiful design and stellar functionality. 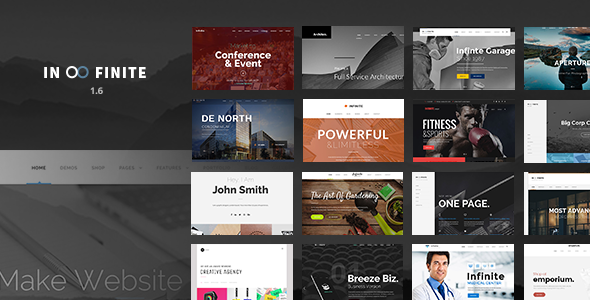 There are plenty of features in OldStory such as 2 homepage layouts, one click install, mobile friendly sliders, page and shortcode builder, different header layouts, original hover effects, lots of navigation options, and slider options. There is no doubt this theme will enhance your website and bring new customers. White Rock is crucial for any business especially a pub, winery, or brewery. This theme will keep your business relevant and modern giving it a contemporary look and feel. White Rock is highly customizable and includes unlimited colors, multiple menus, retina support, translation files, a complete video documentation, demo content, and lots of widgets. White Rock will help your business stand out from the crowd though its beautiful animation effects and attention grabbing design. I recommend checking it out! 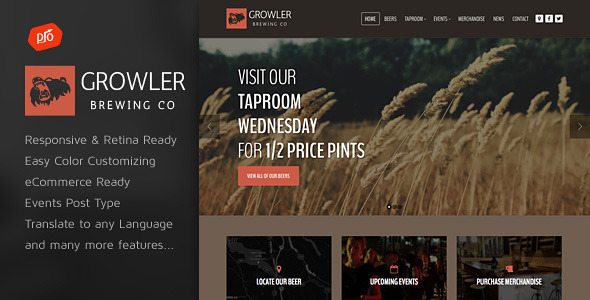 WordPress template for pubs, wineries, and brewery have a role to fulfill and Growler does his very well. It is incredibly easy to customize Growler thanks to its intuitive theme panel and self-explanatory features such as unlimited color schemes, demo content installer, shop template, events manager, beer listings, Slider Revolution, useful shortcodes, and much more. Growler does not come with any standout or original features, but the ones it has will help you build your website faster without the help of a developer. Check it out today! 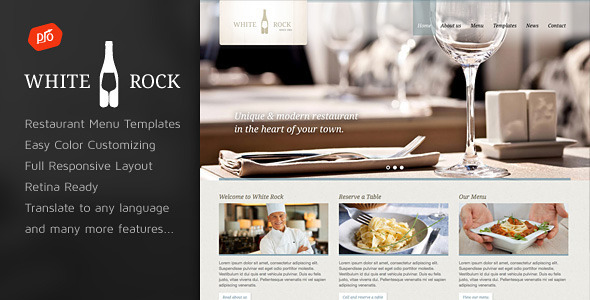 I hope you enjoyed our selection of the best WordPress templates for pubs, wineries, and brewery. We have scoured the internet for them and chosen only the top-notch themes. Each theme presented here will enhance your website and business. If you believe we missed some, let us know!